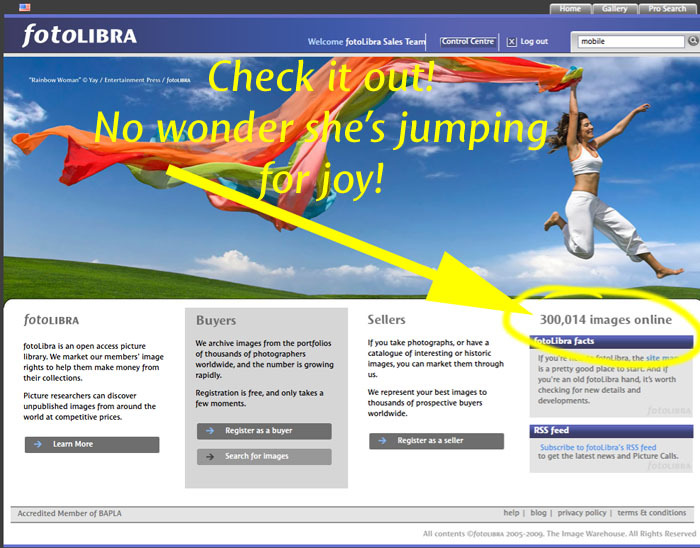 Today fotoLibra passed the landmark of 300,000 high quality, hi-res images on line. While we’re not yet quite up there with the Gettys and Corbises of this world, it’s still a goodly number and enough to give picture buyers a very wide and eclectic selection indeed. And all our images have come from our 17,000+ wonderful members, photographers, collectors and artists. But mainly photographers. A lot of the monster stock agencies merely represent other collections, so their picture count jumps by 50,000 each time they sign up a new agency. Our images are uploaded individually, directly to our servers. They’re each selected with care and pride. So we’re all pleased, except the office has been laid low by a lurgy and I’m the only man standing. So I get the magnum of Krug. Shame. I remember when the idea of fotoLibra was just a gleam in my rheumy eye, I sought advice from the wonderful Anne-Marie Ehrlich, doyenne of picture researchers and the heart of The Picture Desk. While not exactly dismissive of my beautiful new baby, she said it was hard for a picture library to be taken seriously until it had accumulated about 25,000 images. Done that. Been there. Beaten it by 275,000. Now to be taken seriously! We have been deluged by junk mail over the past few days, even more than usual, and as Yvonne has a migraine I’m checking her emails as well. I thought I got bombarded with junk — but she gets twice as much. She was sent over a thousand between midnight and nine am. Anyway, this morning Jacqui Norman sent out four Picture Calls to our members (who sign up voluntarily — there is little or no coercion) and loads of them came bouncing back, all with email addresses ending in yahoo.com — Delivery temporarily suspended: host mx2.bt.mail.yahoo.com[195.60.116.133] refused to talk to me: 424 4.6.0 [TS02] and other such impenetrable computer speak. If I’d signed up for a service like fotoLibra and didn’t hear anything more from them, I’d be inclined to think the company didn’t care. It wouldn’t occur to me that my service provider was blocking messages from them. It’s damaging to us, but I’m at a loss as to know how to deal with it. The prime offenders are Yahoo, Hotmail and BTInternet. We even have a note in our Welcome email to new members that if they use one of those service providers for their email, the should add mailman@fotoLibra.com to their address book. Even that doesn’t always work, but it helps a little bit. We’ve tried contacting the companies direct, however we have but a limited life span on this earth and I don’t intend to spend it listening to ‘Fur Elise’ played on a Stylophone. These are companies that are not comfortable talking to customers or other outsiders. Maybe they have Google Alerts when their names get mentioned frequently. So, Yahoo, Hotmail, BTInternet, Yahoo, Hotmail, BTInternet, Yahoo, Hotmail, BTInternet, Yahoo, Hotmail, BTInternet, Yahoo, Hotmail, BTInternet, Yahoo, Hotmail, BTInternet, Yahoo, Hotmail, BTInternet, Yahoo, Hotmail, BTInternet, Yahoo, Hotmail, BTInternet, Yahoo, Hotmail, BTInternet, Yahoo, Hotmail, BTInternet, Yahoo, Hotmail, BTInternet, Yahoo, Hotmail, BTInternet, Yahoo, Hotmail, BTInternet, Yahoo, Hotmail, BTInternet, Yahoo, Hotmail, BTInternet, Yahoo, Hotmail, BTInternet, Yahoo, Hotmail, BTInternet, Yahoo, Hotmail, BTInternet, Yahoo, Hotmail, BTInternet, Yahoo, Hotmail, BTInternet, Yahoo, Hotmail, BTInternet, how do we become an acceptable entity in your eyes? Clever it certainly is. But sustainable? Surely designers and photographers will come to their senses? Or is this solely aimed at the sub-graduate sector? Whatever; if this really catches on there won’t be any jobs for them to graduate to. Designers and photographers need the protection of agencies such as fotoLibra to save them from themselves.